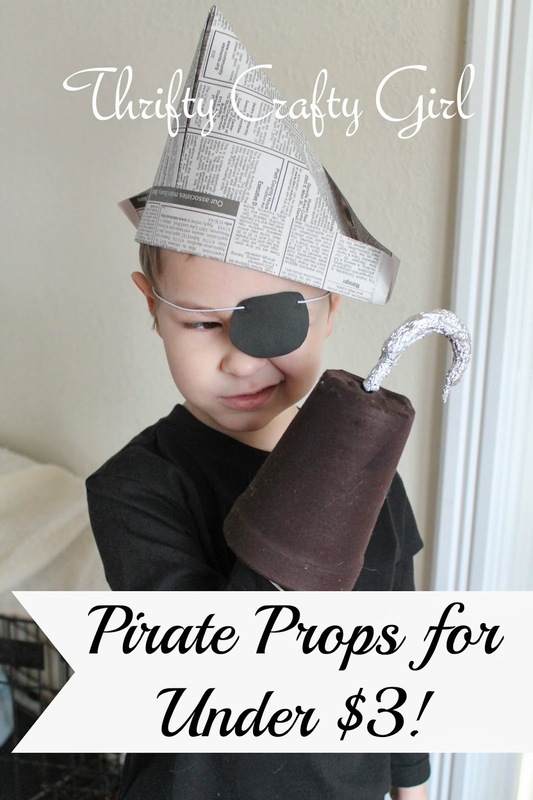 Thrifty Crafty Girl: Make Pirate Props for Under $3! One of the most important things we mommies do is encourage our children's imaginations. Every week, my kids are pretending to be something else, sometimes an animal and sometimes a desk lamp. We're a strange family. But what is a thrifty crafter to do when her youngest son is begging to be a pirate? I thought you'd never ask. If your kids are anything like my kids, they are constantly dressing up like characters. I mean, I know on my blog there are several pictures of the kids wearing Halloween costumes even when it wasn't Halloween. Playing pretend is a timeless tradition, I suppose! I love to encourage their little imaginations, but I don't want to spend a ton of money... and if I can help it, I'd like to not even leave the house to make it happen. And so, I present to you, pirate props for under $3! And then I folded the bottom on both sides. Voila, a pirate hat! And then added some foil to the hook. To finish it off, I pulled an old dress sock over the cup. Boom. Pirate hook. Total cost: I bought the cups, a 16-pack was $0.97. So far, we're at less than a dollar! Total cost: $0.38 for the foam sheet and $0.97 for the elastic. Of course, if you have these supplies on hand, you'll pay nothing at all and you'll bring happiness to your children. ARRRRR! (That's 'awesome' in pirate-speak. Fun was had by all! Until they made me walk the plank, that is. This is a brutal family, I tell you. And check out this great new movie from the world of Peter Pan, an all-new Tinker Bell movie: Disney's The Pirate Fairy. Own it on Blu-ray™ and Digital HD April 1!